Quasicrystals are solids with quasiperiodic crystallographic order and rotational symmetries forbidden by classical crystallography. Because of their unusual physical properties, including high strength, quasicrystals are of interest for potential energy applications. As a result, their behavior under extreme conditions has been a subset of study in EFree. New work from a group led by EFree Affiliated Scientist, and former EFree Postdoc, Vincenzo Stagno (Ehime Universtity) and colleagues from Carnegie, the Advanced Photon Source, the University of Florence, and Princeton University provides new data on icosahedrite, the first natural quasicrystal, at extreme conditions. Icosahedrite, an alloy with composition Al63Cu24Fe13, was found in the Khatyrka meteorite. Stagno and co-workers carried out high pressure experiments on a synthetic sample of icosahedrite using both in-situ diamond anvil cell and synchrotron radiation techniques at the Advanced Photon Source, as well as quench experiments carried out in the multi-anvil press facilities at Carnegie. 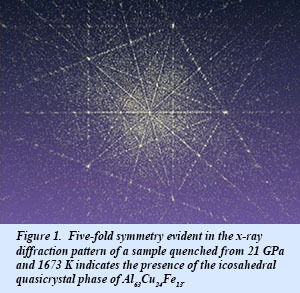 In-situ powder diffraction experiments show that the icosahedral structure of Al63Cu24Fe13 is stable up to at least 50 GPa at room temperature, while quench experiments indicate that high pressure acts to increase the stability of the material up to temperatures of about 1700 K without melting or structural change (Fig. 1). The results have inetersting planetary and astrophysical implications. The work suggests that the natural quasicrystal forms either by causing diffusion out of an Al + Cu - enriched FeNi alloy, or during nebular formation and later impact. In either case, the icosahedrite remains stable under the P-T conditions explored. Thus, the presence of icosahedrite in meteorites may serve as an indicator of exposure to high pressures and temperatures during the course of its existence.